I don’t expect many people to remember Astal. As somebody who bought a Sega Saturn first and a Sony Playstation second, I, however, do. Astal is an interesting-but-not-spectacular 2D game that crafts a beautiful world with wonderful music and some interesting ideas, but misses its mark on some of the game mechanics. Its main problem is the controls; to defeat enemies, Astal himself often has to get dangerously close, and coupled with the small life-bar the game gives you, this can lead to frequent death. The attacks themselves aren’t even really very satisfying, either, so it ends up kind of a lose-lose situation. The game offers drop-in/drop-out co-op, with Player 2 taking control of Astal’s bird companion, and the bird’s attacks can definitely make up for Astal’s lack of range. When not controlled by a human, the bird simply follows Astal, and Player 1 can give it simple commands. 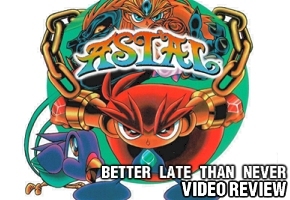 Astal could have had a chance at being the next Sonic the Hedgehog, but poor timing and some unfortunate game design choices have instead created a forgotten gem.